dsRNA is cleaved at specific sites by Dicer to form siRNA. 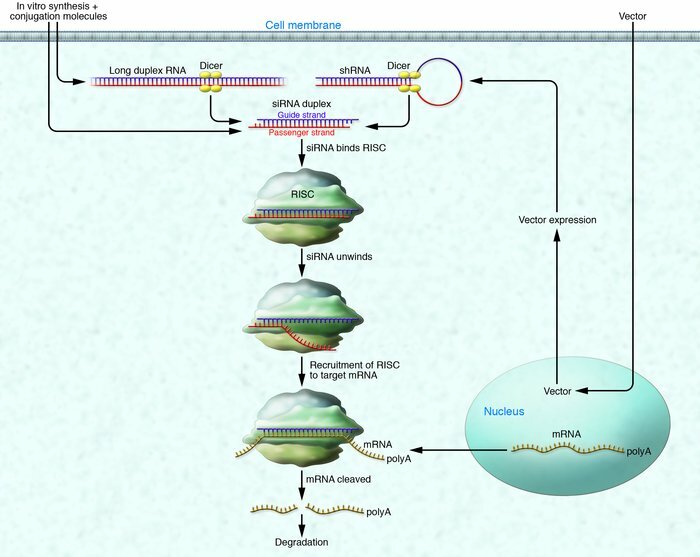 siRNA can also be produced either in vitro, after which it can be conjugated to other molecules for efficient delivery into the target cells, or within cells, via DNA-based vectors encoding shRNA. siRNA binds to RISC, the action of which exposes the antisense strand of siRNA and allows it to recognize mRNA with a complementary sequence. Upon mRNA binding to RISC, the mRNA is cleaved and degraded, resulting in the posttranslational silencing of gene expression. Figure modified from ref. 93.